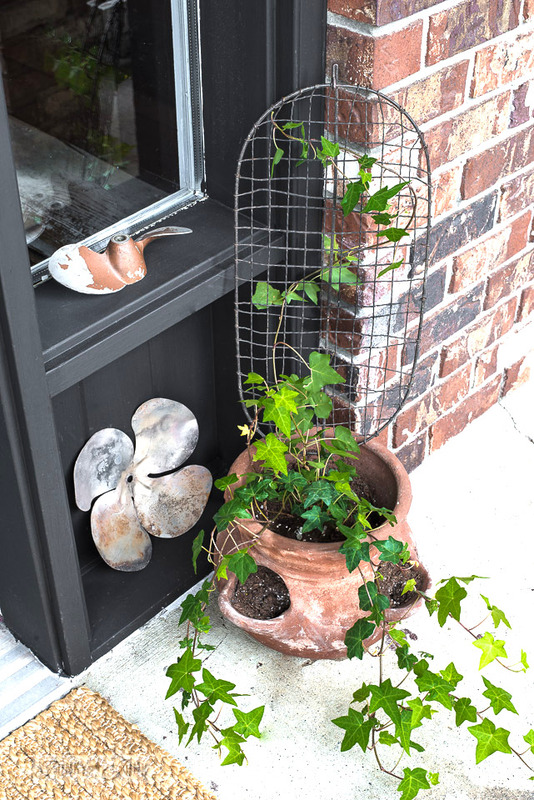 You know those projects that sit on the back burner forever, because one ugly thing is attached to the other, and if you’re not careful, you’re liable to redo your entire house? Do I have a doozy for you. At long last, meet my GORGEOUS pretty front door entry! Which looked like this just a couple of days ago. Ugh. So bad. It seriously looked like a somewhat abandoned home via the entry alone. A mess of several different painting finishes, and a door completely scratched up from who knows, wearing a very dated colour that didn’t even go with the house. The house wears what I’d consider dated brick, and siding I don’t love. The house trim use to be this burgundy when I moved in, but it made the house look pink. The first thing I did when I moved in was repaint the trim to a gorgeous warm black / deep chocolate brown. My intention had been to paint the door in the same colour. But I stalled painting this area, because I hated working with the oil based paint I was using at the time. I didn’t want roller marks, and I didn’t want brush strokes, and I didn’t want to buy a high end sprayer to only have to figure out how to clean oil paint out of it. And then this little blessing dropped in the mail, which changed my mind in a quick, hot second! 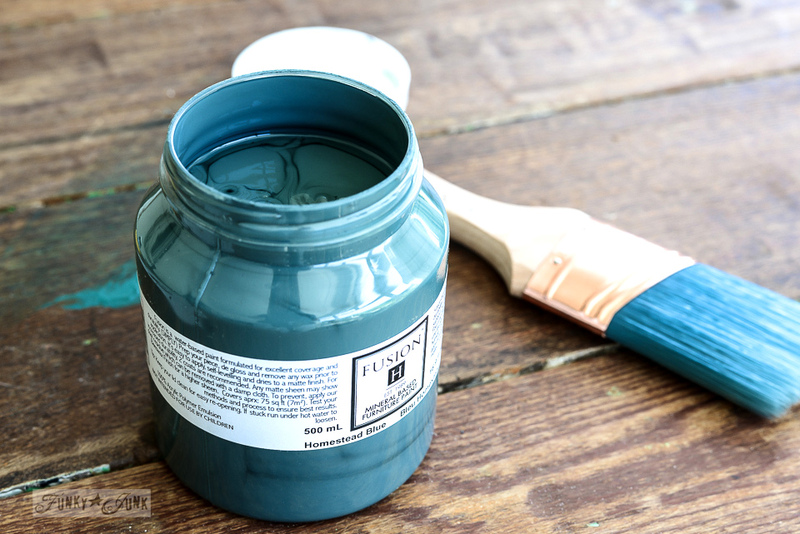 I am in a blogger program with Fusion Mineral Paint, so I have the opportunity to test their paint out. So when I received my newest order, I ripped open the box while still wearing PJ’s, grabbed my Homestead Blue and fav new BFF brush (ask a merchant about them! ), and sprinted towards the front door. Fusion promised to make this easier than working with my crap oil paint, so I wanted in. I’m super stoked I waited now. This short handled angled brush is new to the line, and WORD… it cuts in and covers like a dream!!! Super sharp lines. I didn’t even need painter’s tape on the window around the door! The first thing you want to do to these cute pints is to give them a good shake. Look at that liquid gold… you can just about hear it glug while I shake! I want to drink it! 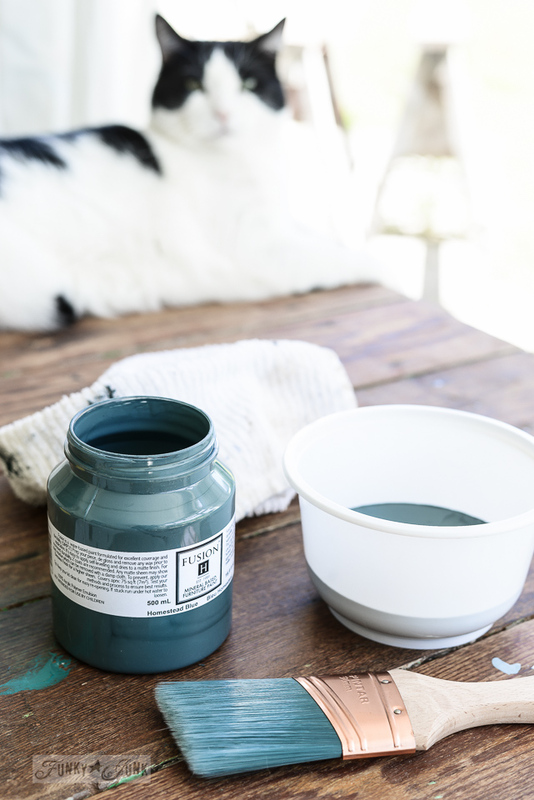 The 2nd thing you want to do… or I like to do, is pour the paint into a new container. I’ve been a faux painter in the past for my artist friend, and our #1 rule was always, pour paint into another container before using, so you don’t contaminate the original. There’s another reason I like doing this… Fusion has intense bonding capabilities, and your lid can get stuck to the paint container. I also WASH the lid, and wipe down the rim. And then I just went for it. 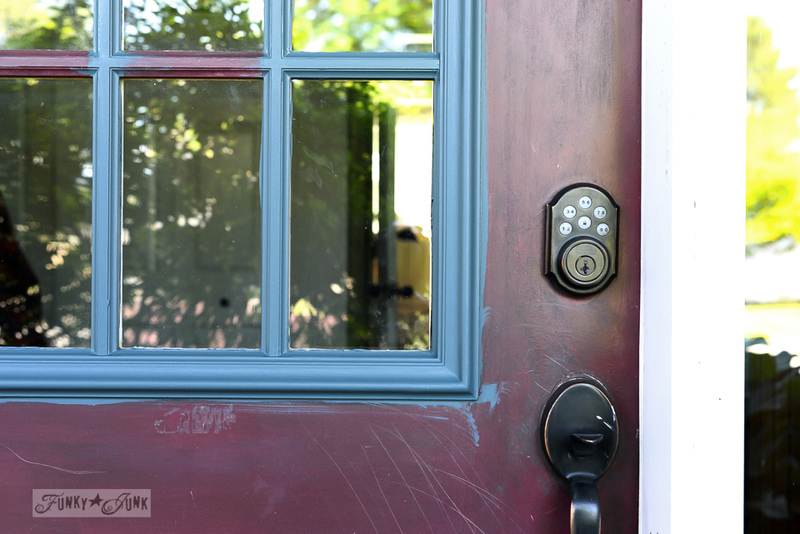 It honestly took me longer to remove and reinstall the door hardware than it did to paint the one coat! That’s all it needed. So I ran to the hardware store (with 5 minutes to spare before they closed), and picked up more trim colour in latex this time. THEN BAM! I had this gorgeousness in front of me! Isn’t it a complete stunner? I chose to work with the brick, because I don’t know what to do with the outside of the house yet. It will be big coin to update, so I like to start like this first, to see how far I can push the original. And that is why I chose blue for the door. I love how it cools down the warm brick. 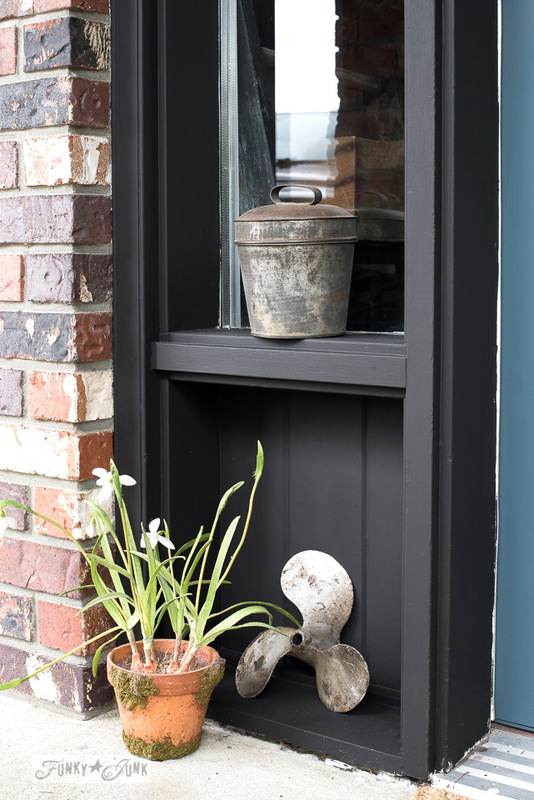 And the brown-black trim colour really frames both the brick and the door beautifully. And then I treated the side windows like an industrial showcase of sorts. That brown – black demanded it! I still haven’t blogged about my trip to NYC yet, but here’s one trinket I found at the Chelsea Flea Market while there. The tin above was only $10, so it needed to come home with me. A couple more propellers / blades on the other side sealed the deal. They are from Granny and Grumpas, and reader Sandy, from THIS post! To… punch you in the shoulder like a high-5 blue! Seriously, how can such a little amount of paint make such a big difference? But the MUCH bigger question… why did I wait YEARS to do this?! 1. I only needed one coat, but you may need two. 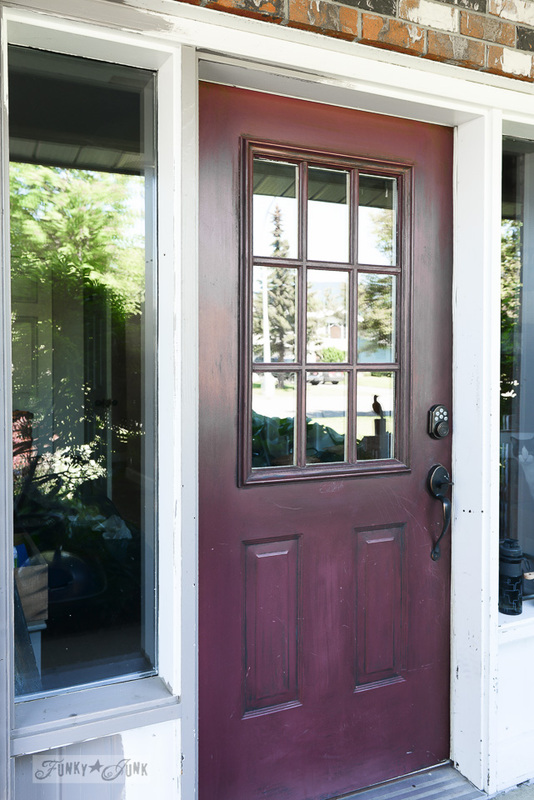 I am a cheater styled painter, and like doing things (too) quick… but I was honestly super happy with one coat of paint on this door! I really do think the brush made a difference for perfect coverage. 2. Ask a Fusion rep how to test / prep your surface before painting. 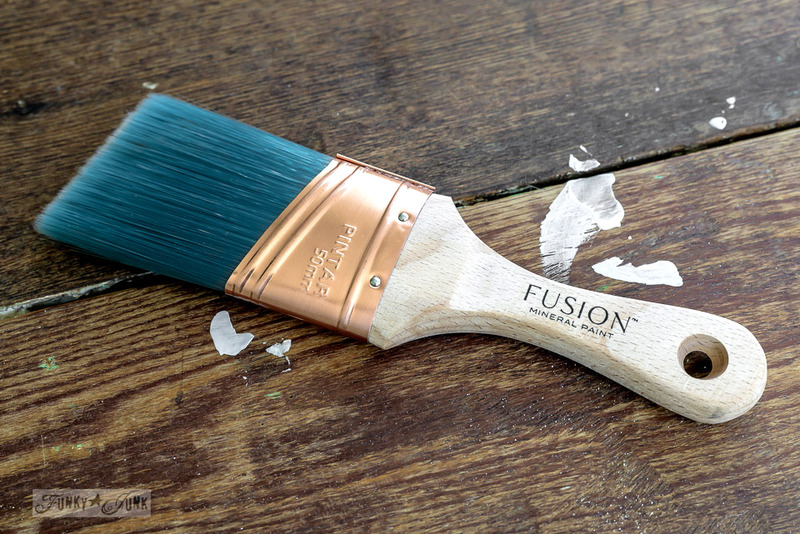 While Fusion includes a primer AND top coat, in some cases you may need ultra grip to prime. It all depends what your base is. My door was metal, but I had smeared an oil based glaze all over it, resulting in the Fusion paint scratching off a little too easily. My fault. I should have cleaned and prepped the door, and did a test. Thing is, all my past Fusion projects didn’t require any prepping, so I was spoiled. So I’m going to be careful, and see what transpires. Honestly, this paint covered so quickly and beautifully, and took so little, I can see playing with a new colour a season. I kid you not! This was way too much fun! 3. 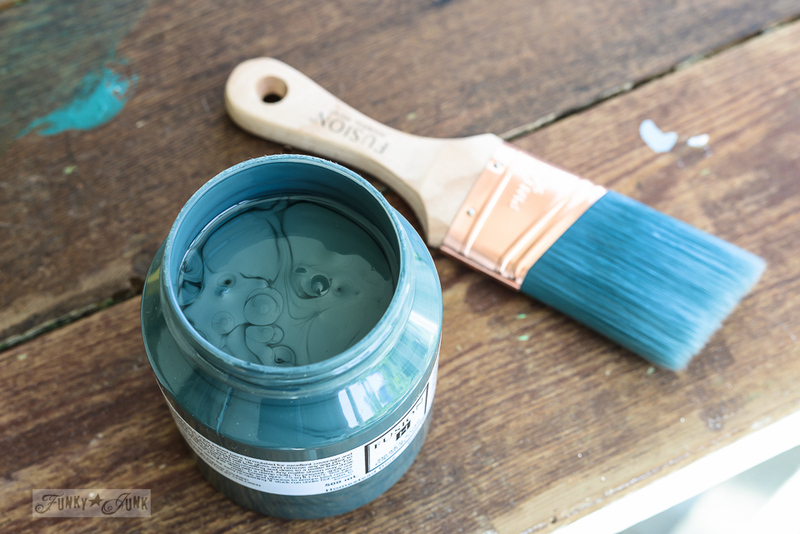 This paint wears a gorgeous, matte finish, and goes a long way. Which I much prefer over semi gloss or satin, when working with deeper colours. Just be aware, you may notice finger prints or scuffs. I have the same thing happen with my flat, brown – black trim colour too. But a simple wet cloth removes any prints or marks with ease. To me it’s worth it. I love matte finish over sheen. I also adore the coverage. One coat may be enough for your project, and the flow is like working with whipping cream. It glides on. My fav part! 4. Take the time to clean the paint lids. Seriously. Wash the lid, and wipe the rim. Or place a plastic baggie in between lid and container. The adhesion on this paint is crazy strong. Lots of folks ask me about working with Fusion, so I felt the tips were needed at this point. p.s. and make sure to get that brush! Disclosure: I work with Fusion to create with their paint, but was not compensated for this project. All drooling over Homestead Blue is from my own heart felt feelings. And I am smitten! What colour is your front door? What would you like it to be? Your entry is beautiful and I love your choice of colors. The blue is the compliment to the orange/brown bricks. Absolutely wonderful transformation. Way to go Donna! Another project well done! 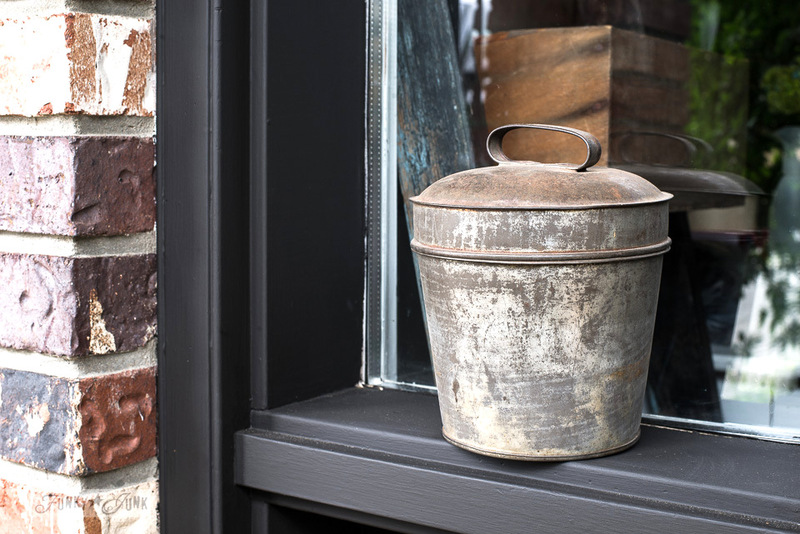 Hey I recognize that metal container! 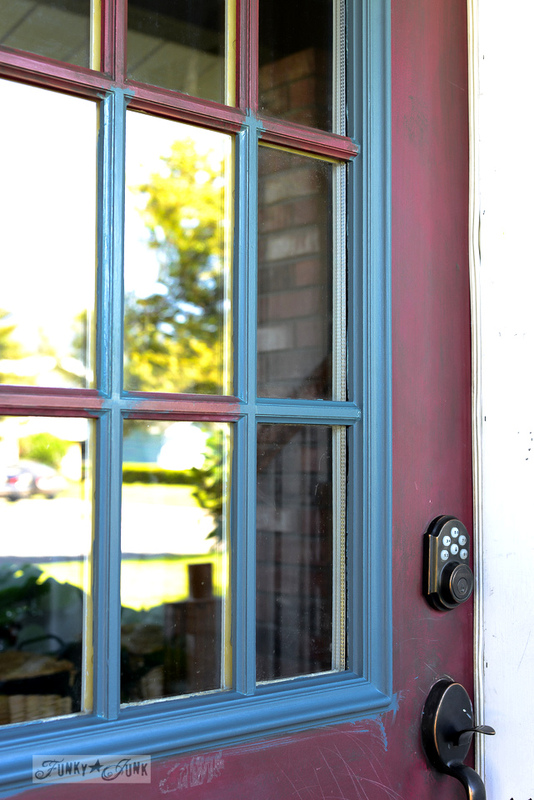 It looks great on your beautiful new door. The blue with the black was an excellent choice 🙂 Now I’ve gotta go do mine. Love, love, love your door! The shade of blue is awesome and the black-brown trim looks so industrial. It appears that the blue and black-brown echo some of the shading of color in some of the brick. I wonder if it looks that way in person. Wonderful choice and paint job! Have a great day! 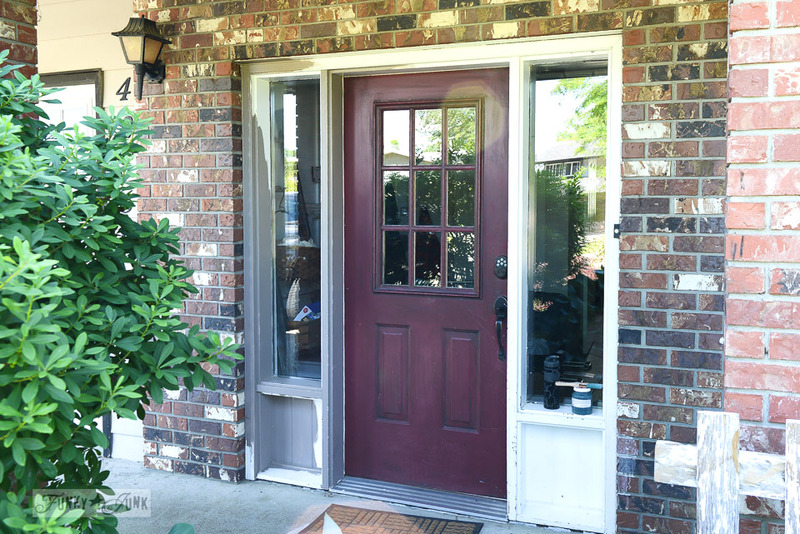 The door looks great and thanks for the paint tips….I have a question…… Why did you switch to another type of pant for the door trim and not use the fusion brand there as well? The house trim is already done everywhere else, so I didn’t want to start over with a new colour / new paint for that part, just keep using it. But I’ll truly admit, I hated working with the house paint compared to Fusion. The coverage and flow just isn’t the same. Fusion has very special properties I love that other paints just don’t seem to grasp even close. LOVELOVELOVE what you have done with your door and trim! Have been looking at colors and couldn’t quite make up my mind – after a while they all ‘swam’ together and just quit looking. 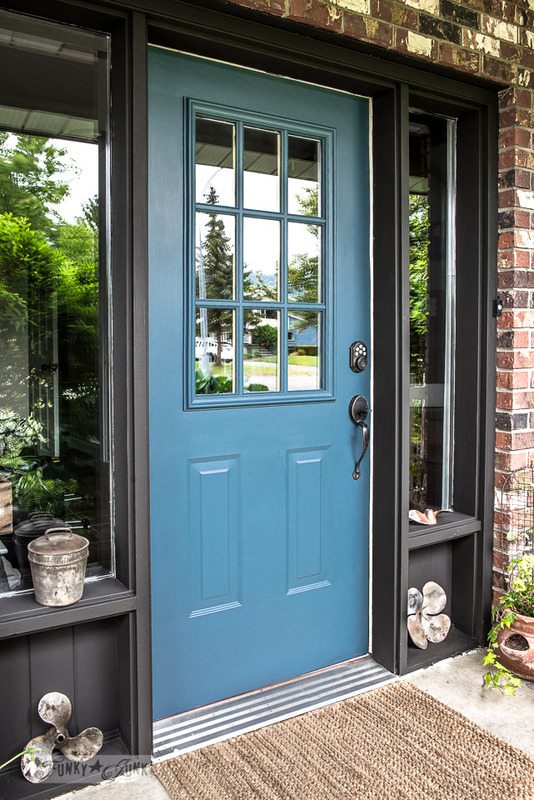 Love the colors you have chosen for the door and am seriously considering the ‘Homestead Blue’ you chose. 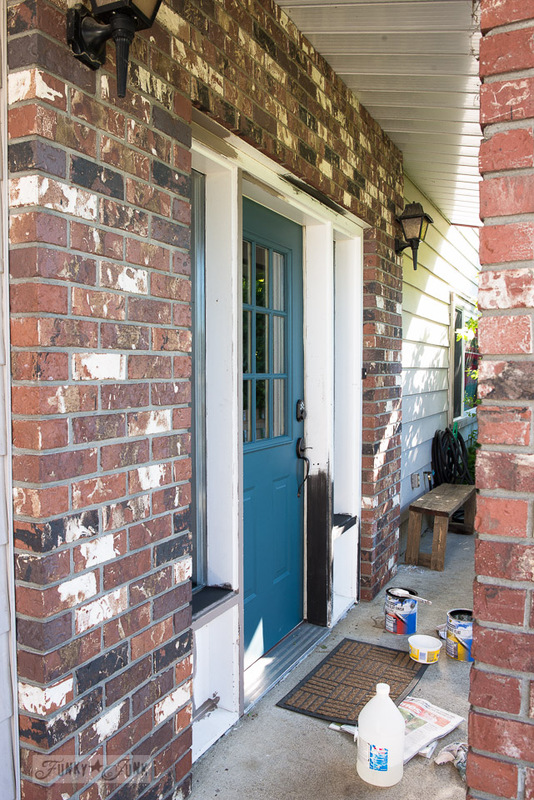 I have brick on my house that looks a whole lot like yours – but would just love to know what paint you chose for the trim. May I ask what paint and color you used? LOVE IT! Hi Barbara! The blue is gorgeous! Just the right amount of muted without being bright. LUV!!!!! Please, do keep us up to date on the wearability of this paint. I love it! 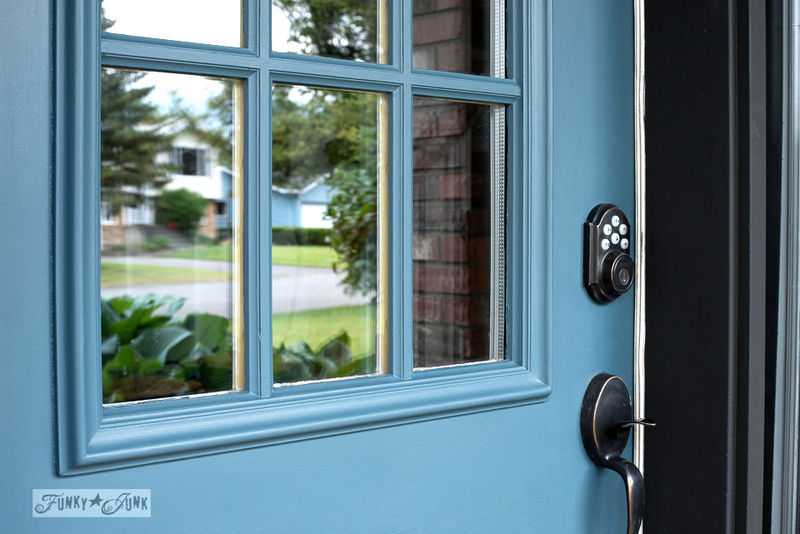 Great minds obviously think alike 🙂 Thanks so much for sharing my post also and for your kind words–hopefully I will be as knowledgable as you say I am 🙂 Enjoy your lovely new front door! Donna – is this a new color? Doesn’t show up on the link of the colors so assume so. I really love the color. My exterior must have something done to it this summer and this may be the perfect color. Your entry way is seriously awesome now. And I can’t believe you don’t LOVE the brick. It’s perfect. Especially with the new door color. The paint totally changed my mind, Sia, now I adore it! 🙂 Just gotta work with what’s there, for sure! The best projects are done in pjs!!! It looks wonderful!! I have that same door and hate to paint all the window divisions. I will never buy a door like that again, lol. Wow paint that covers in one coat sounds like a hit. Love the new color! Love that blue. Love the brick. I am painting all my windows right now. No fun, like your door. Doing a file cabinet next. Maybe I will use that blue. Wow, it’s seriously fabulous. Just awesome. I have a back door and trim to paint so this post came at the right time. Thank you! Donna, your door is gorgeous, and I especially love the junky eye candy! Please let me know if Fusion paint is available in Quebec. I didn’t see it on your site. I searched the Fusion site, and sadly didn’t see any findings in Quebec. BUT if you put in the town you desire, they will show up! At the bottom of my post, I included the above link so one could search their given areas. I hope you can find some! Ohhh Donna ,this is such a welcome post! Your door is gorgeous! I absolutely love what you have done! Yes,it makes a woman proud…..
We have 2 of ,the ugliest doors I have ever seen,on our manufactured house. I am ashamed of them, thankfully no one can really see them. There’s so much to do here I don’t know what number priority they should be. You made it sound easy and fast! We just ” remodeled”our itty bitty closets,which reminded me of your laundry room fix! It is so good to be connected to you again! 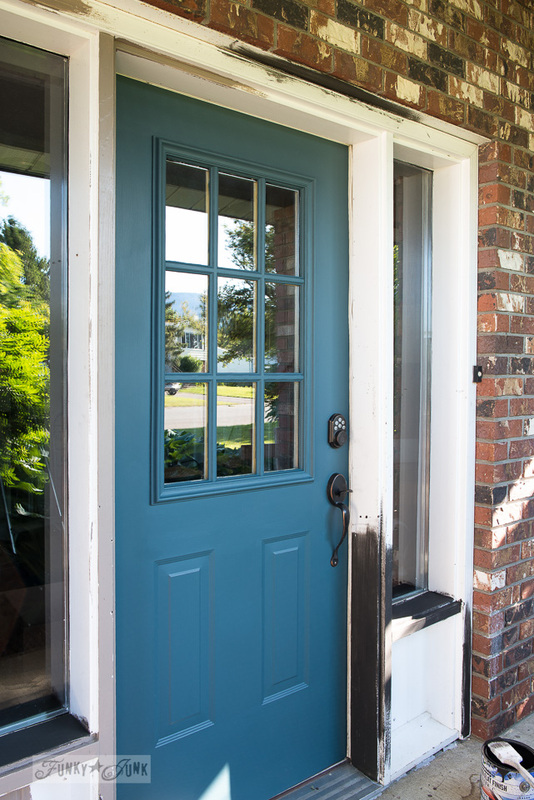 Love the door…hmm wonder if there is teal or aqua in this paint? Can it be bought at local HD or Lowes? Nicely done my friend! Wow!! Stunning door and trim, just loving it!! I want to repaint my cement porch and stairs, what is the name of the color of trim paint you used. You said it was a brownish/black color!! Thank you for your help. loving your posts!! Wow what a wonderful transformation!!! It looks like a totally different house! 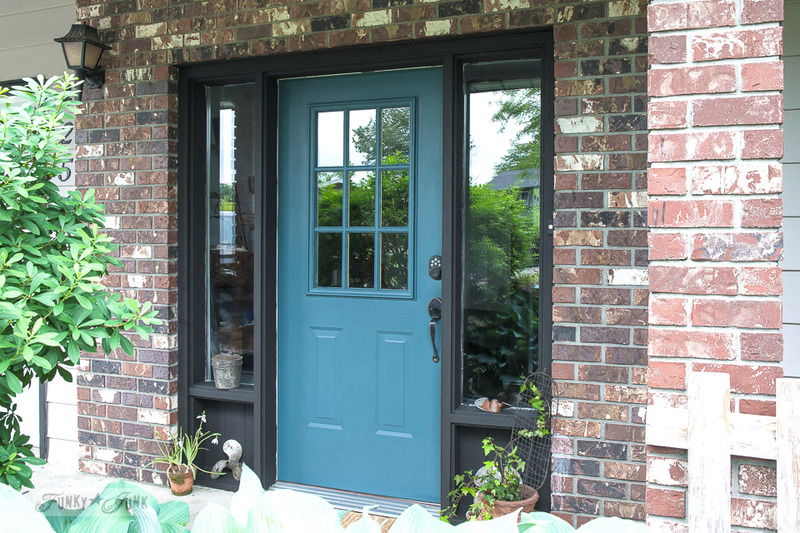 I’ve been thinking about painting my front door this exact same color but I have a question. My house has lots of redwood siding (emphasis on the RED), so do you think this color would go with it? Hey Teresa! I like to look at a colour wheel and grab an opposite colour if you wish for a contrast. I wanted to tone down the red of the brick so I knew blue would be cool. Do you have a picture of your home? Feel free to share it on my FB page and ask the question, FBers love to chime in with advice! What a transformation! A fresh coat of paint changes everything. What you did here enhances the door and windows and makes them look new again. White trim is usually my favorite, but your choice of black makes a much improved statement. Go, Donna! Maybe it was the PJs. Painting is one of my least favorite things to do. But, a fresh coat of paint is one of my favorite things, too. I appreciate the information on Fusion. You have a large, wonderful entry space. The new door color really draws the eye. Consider multilevel and larger accessories. While the propellers are great, displaying them together on a table or shelf would give them more visual weight and interest in front of the brick. It would be wonderful look. You have a pallet bench to the right of the door. Maybe you could try a pallet and metal creation for the display. Your DIY skills are amazing. Gather your plants togehter on one side, also in containers of of varying height. Use a recycled tool box for the smaller plants, but have one with more vertical height to balance the shelf you are going to create on the left. 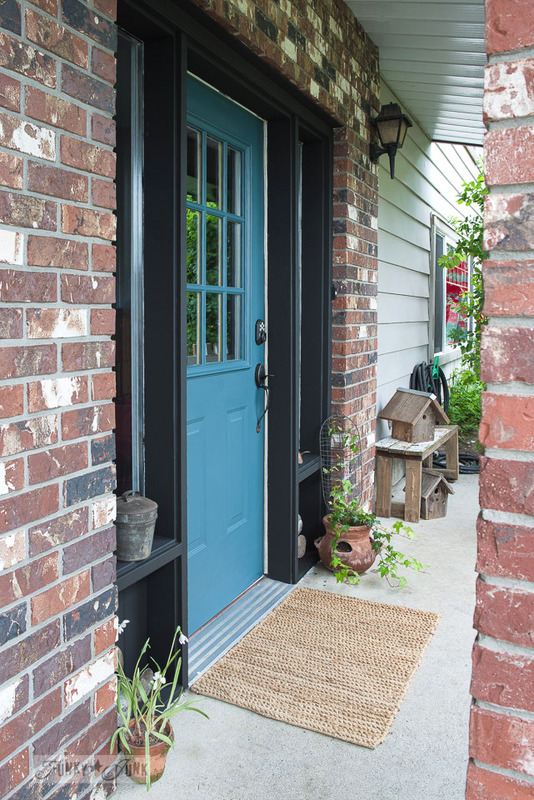 Upsize your light to a large lantern so your beautiful blue paint and door are more welcoming by night, too. You have such a creative flair and great ideas. I don’t want to step on that. But I know I sometimes need a “nudge”. Really excellent color choice!! Blue and brownish-black look awesome together. And the way they compliment the brick is just fantastic! You really have an eye for these things!! Very pretty! Is Fusion paint low in V.O.C.s by any chance? Yes, it sure is Kathy! Hahaha! I’ve also often run outside all excited and painted something while in MY jammies as well 😀 I swear the neighbors must think I’m crazy! Love your door! I know I’ve seen those little Fusion bottles somewhere and assumed them to be little craft/sample sizes… I’ll now have to look for both the Fusion paint and brush now as I’m a paint (and good brush) fanatic …Mom always said that you can get the biggest change by painting vs crying over not having the money to remodel. We have the exact door in a very similar color from 1980. We need to repaint it and were unsure what color to use. After seeing your post, we may just repaint it the same color. A question that I have struggled with — do you leave all of those windows bare on the inside? Or will you hang curtains or something else? Bare sounds great though I feel like I’d be on display if I left mine bare. Thanks for responding! My front door is school bus Yellow and I want to paint it RED. 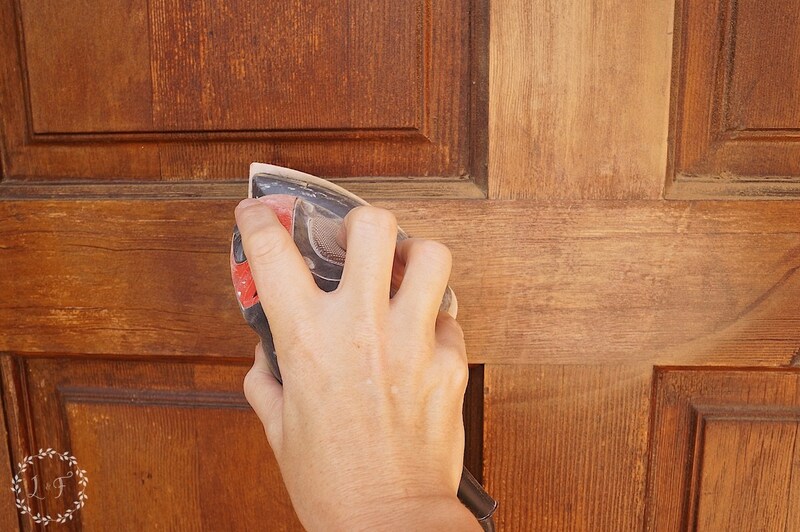 How much paint does it take to paint just the door? I do not see any retailers close to me so i will need to order on line. Any other good ideas you can pass on would be appreciated. Hey Marcy! I used about half a big jar of Fusion for 2 coats for one side of the door. It goes a long way! The entire process really depends on what your door has on it already. If it’s an oil based product, you may need Ultra Grip first. Prep really is everything. My best served advice is to email a Fusion merchant you will be ordering from with all the knowns so they can help guide you on what products you may need.